Please double-click the forward arrow to play the video. The video shows 1 set of 15 repetitions. During a typical nightly session, one would do 3 sets of 15 reps, with a 5 to 20 second break between sets. It's on the downward phase of the motion that eccentric exercise occurs. This phase should take 2-3 seconds. The upward phase should be relatively faster. When doing the one-legged squats, I'd recommend the following, which is not shown in the video, and which was not part of my original protocol. 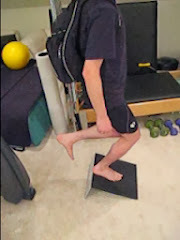 It will help you to focus more of your bad leg's energy on the eccentric portion of the movement, and less on the concentric part: Once You Are At The Bottom Of The One-Legged Squat (In Other Words, The Point Of Maximum Squat, Just When You Are About To Return Up To Standing) Come Up To Standing With BOTH Legs. Wanted to thank you personally for this video. I've been having problems with weakness in my knees due to repetitive stress from martial arts for nearly 2 years. After doing this exercise for a week and a half I've noticed significant improvement and reduction in pain. You rule. After suffering with knee pain for years I came across this page while looking for answers counter to the standard "tendinitis" diagnosis I had been receiving. The exercise protocol listed here has worked for me tremendously. The only modification I made was to perform the squats with the leg in front (pistol squat) and two legged weighted squats on the board. My knee (leg) has gotten significantly bigger and functionally stronger in 6 months as compare to before where nothing was working over a period of years. I went from not being able to run, ride or jump to dunking the basketball again and enjoying my favorite athletic activities again.